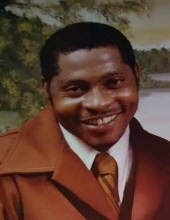 Celebrating the life of Daniel Wright, Sr.
Obituary for Daniel Wright, Sr.
Mr. Daniel Wright, 75, of Little Rock, Ar departed this life on Saturday, April 13, 2019. He was born in Chester, South Carolina on October 5, 1943. He is preceded in death by his wife Octavia L. Wright, daughter Gwendolyn Wright and nephew Cedric Wright. He accepted Christ at an early age and worked for Chicago Mill Lumber Company in West Helena, AR for many years. He is survived by one daughter Darlene Wright of Little Rock, AR; one son Daniel (Keisha) Wright, Jr. of North Little Rock, AR; one sister-in-law Rebbeca Davis of St. Louis, MO; two brothers-in-law Willie B. Stewart of Chicago, IL and Oscar Murphy of West Helena, AR; three grandsons Fredrick Jerome Wright, Daniel DeMarcus Davis and Brandon Dean, all of Little rock, AR; two great granddaughters and a host of nieces, nephews and cousins. Graveside services will be held 11:00 am, Saturday, April 20, 2019 at Arkansas Memorial Gardens, 8507 Jacksonville Hwy, North Little Rock, Ar. Visitation 5:00 pm - 6:00 pm, Friday, April 19, 2019 at the funeral home. To send flowers or a remembrance gift to the family of Daniel Wright, Sr., please visit our Tribute Store. "Email Address" would like to share the life celebration of Daniel Wright, Sr.. Click on the "link" to go to share a favorite memory or leave a condolence message for the family.